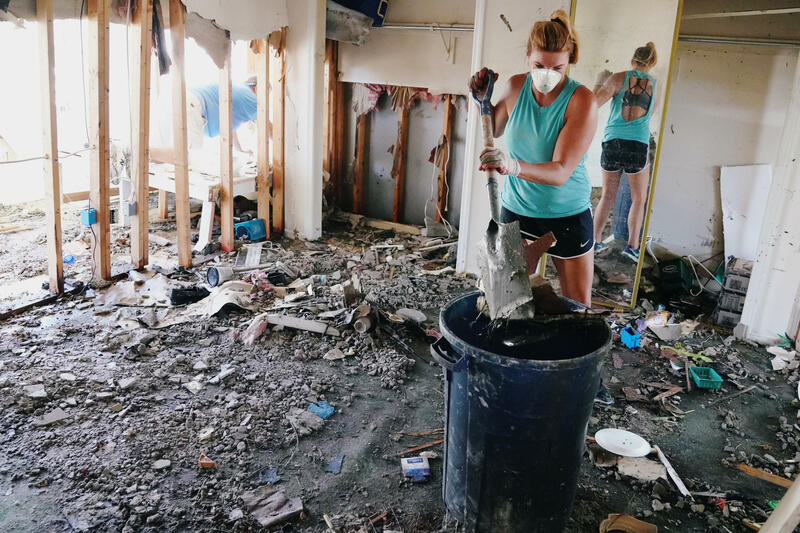 MEXICO BEACH, Fla. — Crews with heavy equipment scooped up splintered boards, broken glass, chunks of asphalt and other debris in hurricane-flattened Mexico Beach on Sunday. The death toll from Hurricane Michael's destructive march from Florida to Virginia stood at 19, with just one confirmed death so far in this Florida Panhandle town of about 1,000 people that took a direct hit from the hurricane and its 155 mph winds last week. Several homes in Cape San Blas were pushed off their foundations by the strong storm surge. A resident named Mark didn't want to give his last name, but he told police he tried to get his next-door neighbor, an older man, to evacuate, but he refused. "Another friend of mine found him and police recovered the body," Mark told CBS News. Joseph Zahralban is overseeing the search and recovery missions in Mexico Beach. He said 230 people rode out the storm in this coastal town. After an initial search of homes and debris piles, 79 people are still unaccounted for. "Today is the first day we are focusing on debris piles — naturally occurring piles that were moved by storm surge and we're beginning to search those as well," Zahralban said. President Trump plans to visit Florida and Georgia to see the damage Monday. Federal Emergency Management Agency (FEMA) chief Brock Long is calling the damage left by Hurricane Michael some of the worst he's ever seen, according to The Associated Press. He toured several towns in Florida's Panhandle on Sunday with Gov. Rick Scott. Long said afterward the storm damage will require officials to help meet housing needs of displaced residents for the next several months. AP reports FEMA employees were going to start going through shelters and in damaged neighborhoods to start registering people for federal assistance that is available to residents after a disaster. In Panama City, the sun was shining down Sunday on members of St. Andrew United Methodist Church. They lost their building, but not their faith. Pastor John Blount took CBS News inside what's left of the structure that's been a fixture in the community since 1955. The main church bible is still intact with only water damage to some of the pages. "I came in here the next morning, I walked in here and saw the blue sky and I said, 'God is God!" He said the night of the hurricane, he stayed at the church and helped shelter 25 people inside two bathrooms and this small closet. His wife, Caroline, returned Sunday after traveling to Alabama with their 11-year-old daughter. "It's unbelievable, and to think they were here in this church, all 25 survived," she said.